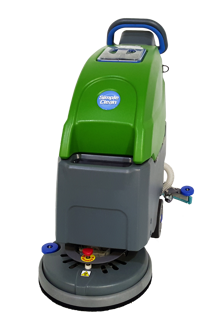 Confidently clean and dry floors in a single pass with the brand new Simple Clean 18 (SC18) auto scrubber. This powerful yet simple floor cleaning tool will deep clean your floors with variable down pressure of up to 55lbs. Its cordless design allows for a tangle free, maneuverable experience. Weight w/ out batteries: 142 lbs. Weight w/ batteries: 265 lbs. Dimensions L x W x H: 45.4" x 20.5" x 42.5"